I believe that Americans, who already seem to love watching English soccer on TV, will absolutely fall for it when they see it in person. And here are some reasons why. Americans are used to football stadiums in suburbs surrounded by parking lots. Basketball arenas are usually the same, or in soul-less developed zones where no one goes except on game day. 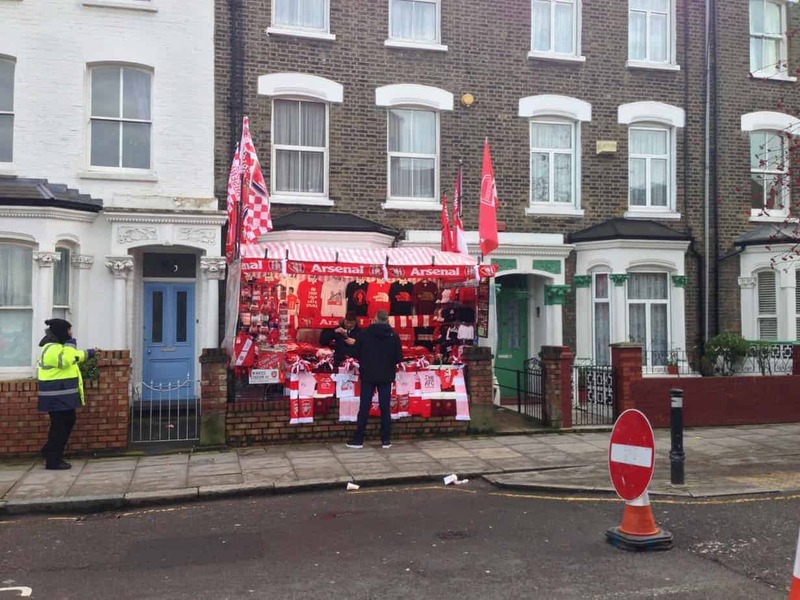 Most of us older folks, though, can remember when we walked through a neighborhood to get to the stadium – and that’s mostly what it’s like in English soccer. It’s right in the middle of town! Chelsea is the best example I’ve seen so far. They are one of the great clubs in the world, with a cabinet full of league trophies, domestic cups, and European cups. 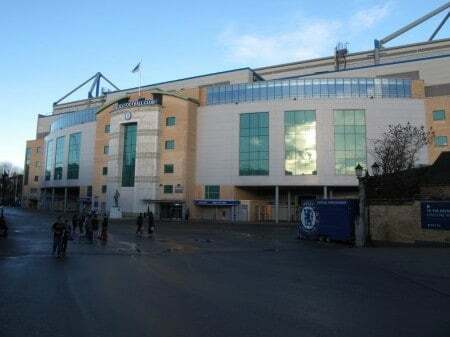 But their stadium, which is a sparkling 42,000-seat palace called Stamford Bridge, is literally surrounded by apartments and about a two-minute walk from a tube station in the middle of a busy neighborhood in West London. Arsenal’s new stadium, The Emirates with 60,000 seats, is surrounded by homes in North London. 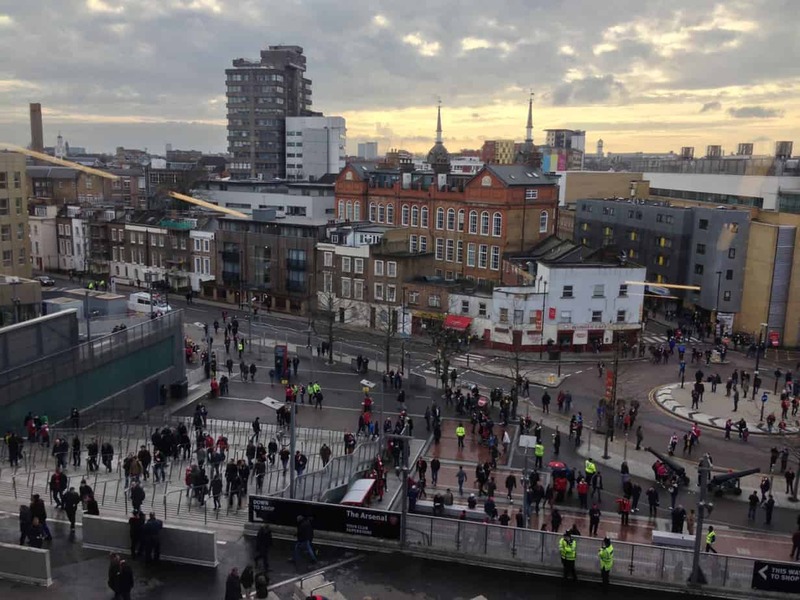 Even though it’s set off a bit by pedestrian bridges, when the game is over and you walk out of your seats, you’re about five minutes from a pub or cafe. And local people set up food and merchandise booths in their yards to sell to the throngs walking over from the tube. Speaking of stadiums, by our standards they are fairly small. The biggest club stadium in the country is Old Trafford, home of Manchester United, with about 75,000 seats. 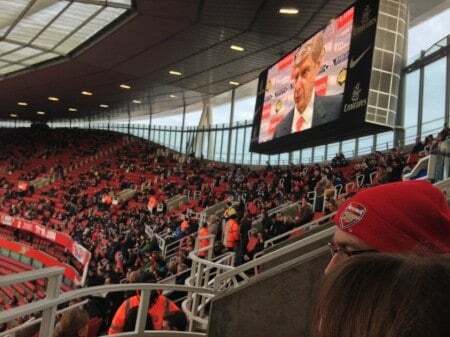 West Ham’s new place has 66,000, Arsenal has 60,000, Newcastle 52,000, and after that it’s 48,000 and down. Many of these are rebuilds of really old stadiums, and the seats often seem right on top of the game. Panorama of Fulham’s stadium, Craven Cottage, with 25,000 seats. The season here runs August to May, and for what seems half that time it’s raining and in the 40s. But not to worry: almost all the seats are covered! Unless the wind is really blowing and you’re down in front, you’ll be dry. Americans think it’s a big deal when San Francisco plays Oakland, or when two New York teams play each other. Well, how about this? Of the 20 teams in England’s top division, the Premier League, six of them are in London! Sure, London is huge, but consider this: Fulham and Chelsea are two tube stops apart from one another. (Were Fulham any good, this would be a big deal). Tottenham and Arsenal, two top clubs who share a bitter hatred, are within a couple miles of each other! And if you go down one more level to The Championship (the second tier league like AAA baseball), you can throw in another half-dozen or so London clubs. Two years ago, when Queens Park Rangers were in the Premier League, you could walk from them to Fulham to Chelsea and back to QPR, and you would have covered less than nine miles. Even cities like Birmingham and Manchester, home to several more big clubs between them, are within a three-hour train ride from London! So going to England to watch soccer is a remarkably compact experience for us Americans. All of this leads to big crowds of visiting fans at every game. Go to an NFL game, or baseball game, or God knows an NBA game – any visiting fans? Maybe a few scattered here and there? At every English league game, there are up to 3,000 of them in one corner or end, even more if it’s a Cup game, singing their guts out and trading taunts with the folks around them. In fact, the “away supporters” section is always walled on both sides by stewards, folks whose job it is to keep the peace. And you don’t sit in the wrong section of the stadium. If you try to walk in to one section wearing the colors of the other, they will walk you over there and give you a different seat. This is more of a soccer thing than an England thing, but still: They go out, play for 45 minutes, take a break for 15, play 45 more, and you’re done. At an American football game, people in the stands (who paid a ton of money to be there) sit around most of the time waiting for someone to play football. Not in England. It’s beautiful – better on TV and in person. There are occasional pauses for an injury or something, but basically it keeps rolling along. At most stadiums, especially if the home team is doing well at all, the crowd is a constant roar of singing and chanting. I went to a game at Arsenal, who’s currently leading the league, and it was awesome. And this was for a game against poor old Fulham. When a big team is in there, or their neighborhood rivals Tottenham come in … I can’t imagine. They also make them up for particular players. This BFG shirt is NSFW! Oh, another thing about going to games in person: You can actually make out what they’re singing! Except maybe in Newcastle. Okay, that’s more than enough for now. Trust me, though: You’re gonna love watching English soccer in person!